ACME STUDIO - since 1986. Watch straps. ALL WATCH SITES - "Replacement Luxury Handmade Leather Watch Straps & Bands." Apple Watch Bands - since 2015. "Mix. Match. Repeat." Change the look of your Apple Watch to make it even more personal. Shop the latest band styles & colors. Armani's latest designer smartwatches come with strap options - since 2015. "They're now available for pre-order and will set you back between $295 and $395." Bamford London - since 2003. Mayfair Straps. Bas & Lokes - since 2009. "Handmade Leather Watch Straps. Custom Watch Straps." Bravur - since 2011. "Our organically vegetable tanned leather straps from Sweden and Italy fit watches with a 20 mm lug width." Casetify - since 2011. "Apple Watch Bands and Straps." Our apple watch bands and apple watch straps are made only with the best materials cos we know you wear your Apple Watch everyday. Choose over thousands of apple watch band designs to style your every look and mood. All apple watch straps are compatible with Apple Watch Series 1, Series 2, Series 3 and Series 4, Apple Watch sizes 38mm, 40mm, 42mm and 44mm. Edward H. Bohlin - since 1920. "Edward Bohlin created a brand that is as iconic as the famed western stars that wore it, from such film heroes as Hopalong Cassidy, the Lone Ranger, Roy Rogers, and the Cisco Kid. We specialize in custom or one-of-a-kind pieces. More than 50% of our production is dedicated to custom work, and 100% of our design and production is in-house. It is the high-class merchandise that counts!" Emporio Armani watch straps - since 1995. "Original replacement straps for Emporio Armani watches." Equus Leather - since 1997. Each strap is bespoke - handmade in England and hand stitched individually. GLOBAL WATCHBAND - since 2000. "Look and feel superior with our men's crocodile watch straps." Grahame Fowler - since 1956. "NATO Watch strap, made by Phoenix, made in the United Kingdom, sold in New York." HIRSCH - "The finest bracelets in the world since 1765." HIRSCH STRAPS - from Watch Obsession, founded in 2008. 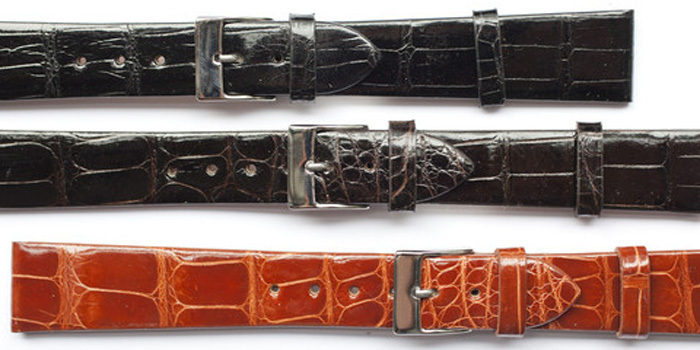 "We stock straps made from Alligator, Crocodile, Calf Leather, Rubber and more." Hodinkee - since 2008. Crocodile straps. "An authentic crocodile skin strap, bred in Louisiana and stitched in Tuscany, is exactly what you'd expect it to be – the perfect complement to your most opulent, formal watch." JEAN ROUSSEAU PARIS - since 1954. "Manufacture Jean Rousseau marries the excellence of its expertise with the sensuality of the rarest skins to produce unique creations." All Jean Rousseau articles are exclusively hand made in France. Also made-to-measure. Jorg Gray - since 1998. Italian leather straps. J.Press - since 1902. Watch bands. Kennett Great Britain - since 2009. Watch replacement straps. Klokers - since 2014. Swiss Made. "klokers watchbands are five models of interchangeable straps which differ in terms of colors and materials, to bring a unique style to your watch. You can then easily clip on and off the watch-heads and create the mix you want." LABB - by Noomoon. Since 2016. 100% Swiss Made. "Clever Watch Strap Inspired by Lego Bricks." LABB: short for The Loopless And Buckleless Band. The LABB’s strength lies in its apparent simplicity. No buckle, no loop, but a secure, hard-wearing, easy-to-use fastener. Lucrin Geneva - founded in Switzerland in 1994. "Upgrade to elegance." Men's & women's classic leather straps. Also Apple watch bands. LUXURY WATCH STRAPS - "Luxury masterpieces to complement your watch." We are the UK's premier supplier of superb watch straps, bracelets and parts. Our straps are perfect for your Breitling, Omega, Rolex, IWC, Cartier, Seiko, Citizen watches. Marloe Watch Company - since 2015. Leather watch straps. Independent designer and producer of wrist watches based in Oxfordshire, England. MICHELE - since 2000. "Luxury Women's Watch Straps." Nike Sport Bands for Apple Watch Nike+ - The "Day to Night" collection by NikeLab. OW Watches Zurich - since 1956. "OW’s watch straps are made from the finest leathers, selected, cut and hand-sewn by a renowned Italian tannery." Sabel - since 2008. "Bespoke Watch Straps." English craftsmanship. Shinola - since 2012. "American Leather By American Hands." Shop straps that fit your watch. STRAPCODE.COM - since 2004. "Leather Replacement Bands for Watches." TC STRAPS - Hand made in Castelfiorentino, Italy. "TC Straps has the LARGEST Selection of Straps for Panerai Watches in the World!" Over 2000 straps for Panerai Watches in stock at all times... In all sizes for every model. The Strap Smith - since 2005. "Handcrafted Custom Watch Straps." The StrapSmith works with the finest leathers from around the world for your custom watch band. Each strap is hand built and hand stitched with every attention to detail. You'll find a great selection to choose from and if you don't see what you are looking for, The StrapSmith can build your unique watch strap. Straps available for Panerai, Bell&Ross, Rolex, IWC, Lum-Tec, U-BOAT, Breitling, Tag Heuer, Kobold, Helson, and many others. Triwa - since 2007. "All our watch leather bands are made of Swedish organic leather from Tärnsjö." Uniform Wares - since 2009. "The atelier is the only place to buy limited edition watch straps and one-off prototypes developed and made in our in-house prototyping lab." Select and order bespoke watch straps, view the collection in its entirety, customise the design of a watch from countless possible combinations of specifications and purchase one-off prototypes - all available only through the Made to Measure service. Visconti Milano - since 1878. "Bespoke & Made to Measure watch straps maker. Made in Italy." In alternative to the standard production, Visconti Milano allows the possibility of customizing the strap according to one’s own tastes, thus creating an original strap. WATCH STRAPS at Amazon.com - over 80,000 results as of March 12, 2019. WATCHBANDCENTER.COM - since 1931. "Deluxe Watch Straps." Huge range of watch straps from basic to premium quality, made of leather, stainless steel, titanium, caoutchouc, silicone, textile, nylon, perlon, synthetic materials, PU etc. from lots of European manufacturers and brands. Weiss Watch Company - since 2013. "American made watch straps." Worn & Wound - since 2011. "Watch straps designed and manufactured in the USA."